Task 55 of the IEA SHC Programme is currently studying the benefits of systems equipped with both flat plate and parabolic trough collectors to supply thermal energy to district heating networks. Preliminary results from a project in Taars, Denmark, have been encouraging, indicating how their combined strength can be an asset across a wide range of solar district heating applications. The research is being conducted as part of the Energy Technology Development and Demonstration Programme, supported by the Danish Energy Agency. Despite the good commercial availability of flat plate collectors, or FPCs, their application in solar district heating(SDH) plants might not always be efficient, as some networks are operated at temperatures of between 90 °C and 95 °C. Parabolic trough collectors, or PTCs, can be immensely helpful for allowing operation at temperatures as high as these without having too much of an impact on the rate of conversion. Now, the question is, “Why would one not want to combine the advantages of both technologies to supply heat to SDH systems?” That had been the basic idea behind the Danish system built in Taars, Zhiyong Tian, a researcher from the Technical University of Denmark, said during a presentation at the International SDH Conference in Graz in April. The system in Taars combines 5,960 m2 of FPCs and 4,039 m2 of PTCs. Water flows through the return line of the district heating network at a temperature of about 40 °C. It is raised by FPCs via a heat exchanger to nearly 70 °C before a field of PTCs, connected in series to the FPCs, increases it to between 80 °C and 95 °C, as required by the supply line. The system is completed by two gas boilers operating a total thermal capacity of 9.1 MW, two storage units that can hold 2,430 m3 and another heat exchanger installed in between the network and the users, around 1,900 people in 850 buildings. Weather data obtained from observations between September 2015 and August 2016 show that each year, DNI, or direct normal irradiation, totals 990 kWh/m2. Globally, annual horizontal irradiation amounts to 980 kWh/m2, while sunlight hitting a tilted surface, as in the case of an FPC, produces 1,170 kWh/m2. The FPCs in Taars generate 448 kWh/m2 a year and the PTCs 354 kWh/m2. Typically, the situation is reversed, but the PTC collectors were defocused manually while measurements were being taken. PTCs, by means of their defocusing feature, can help avoid overproduction, a necessity on some sunny days due to the oversized solar field and little heat demand in summer. Even so, solar heat was priced well below the heat produced by natural gas boilers – which, including fuel taxes, is 57 DKK/MWh (see the green line in the chart below for the net levelised cost of heat). Nevertheless, SDH systems can still be improved upon, as Tian demonstrated when changing the solar field size in several scenarios (see the chart below). 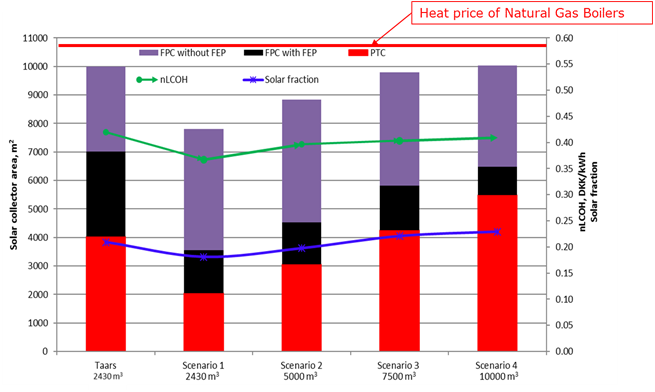 The scenario showing the lowest levelised cost of solar heat has 2,050 m2 of PTCs, around 1,500 m2 of FPCs including a transparent film for insulation, and 4,250 m2 of conventional FPCs. The FPC part of the installation totals 7,800 m2 and heat is available for 40 DKK/MWh (see scenario 1 in the chart below). As the solar proportion is at around 20 %, a price of 40 DKK/MWh for solar heat (see green line in the chart below) reduces the average cost of gas of 57 DKK/MWh by 6 %. “We also analysed scenarios showing variable demand for heat, which resulted in average price reductions of up to 9 %,” Tian explained. His conclusion: Hybrid SDH systems had proved to be technically feasible and economically attractive in Denmark when compared to conventional natural gas boilers, but oversizing was to be avoided in the design phase. Net levelised cost of heat, or nLCOH, in DKK/kWh (green line) produced by various types of SDH systems. The nLCOH is calculated based on an economic life of 30 years and a discount rate of 3 %. In scenarios 1 to 4, the collector area has been optimised to match the storage size stated below the x-axis. FPC = flat plate collector and PTC = parabolic trough collector; FEP is short for fluorinated ethylene propylene and is a film applied in the collector between the glass cover and the absorber.